In Buddhism we speak of being “Mindful” during meditation. In meditation there are two parts of the mind; Concentration and Mindfulness. 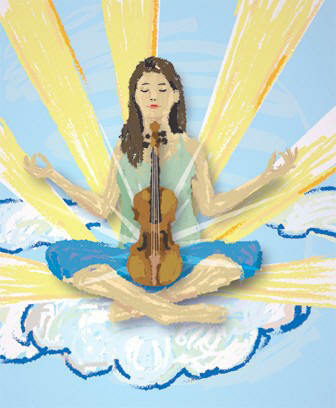 Concentration provides the power to keep you focused on the object of mediation. If and when your mind wanders Concentration is the force that guides the mind back onto the object. Mindfulness is the gentle part that pays attention to the object and notices that the attention has wandered. In this posting I present one of my favorite Symphonies, Beethoven’s Eroica Symphony as a focus for our meditation. To facilitate our mindfulness I put forth some questions that I found in a very old album at a yard-sale recently. Please read through the questions before listening. The questions were devised to help measure audience perception in music appreciation class. But, it was found to do much more: the questionnaire ended up heightening attentiveness! Think about that, if you prepare yourself before you meditate upon something you will pay increase your mindfulness. For those of you who do not share my love of classical music and are not familiar with some of the terms used I have included a list at the bottom of this post. 1. (True or False) Throughout the Eroica Symphony Beethoven uses startling changes in key and rhythm to achieve surprise and shock. 2. (True or False) The first movement opens with a quiet pastoral melody. 3. (True or False) The first theme of the movement is built on three notes. 5. (True or False) The first movement concludes with a short coda. 7. (True or False) There is a fugal passage in the second movement. 10. (True or False) The trio of the third movement features a fanfare for horns. 12. Which of the following instruments prominently play one of the melodies in the fourth movement? where the accent falls on the first beat of each measure. Coda – Closing section of a movement. Movement – A separate section of a larger composition. Sonata – Music of a particular form consisting of four movements. but are held together by subject and style. Sonata form – A complex piece of music. Scherzo – Pertaining to the sonata form, a fast movement in triple time. Rondo – A musical form where the principal theme is repeated several times. The rondo was often used for the final movements of classical sonata form works. imitated by individual parts at regular intervals. The individual parts may enter at different measures and pitches. Fugue – A composition written for three to six voices. creating counterpoint with one another. idea presented in a musical form. Reblogged this on Anything But Work. As a meditation practitioner for more years than I like to think about, I’m not terribly regular in my application of it; I tend to meditate when I feel a need for it, as an anodyne to my angst, rather than using it as a prophylactic against letting such dross build up. It is my angst that drives a lot of what I write, so I use it rather than avoiding it…. but, I’m accustomed to my idiosyncrasies in this respect. That said, I would say that this is an excellent method for focusing and concentrating, especially for beginning practitioners. Plus, you can’t beat Beethoven, not even with a metaphorical stick….. thanks for a great read!…. and the link, for sure…. I share your love of classical music. I often use it for meditation. Gimme Mozart! Though I love Beethoven, too. I am a huge fan of Beethoven’s piano work. I think classical music fills a soul up like no other music.